Today 22nd August is the anniversary of the start of the Dover shelling in WW2 by Germany. Here is a YouTube link, of the German Gun. seems an impressive piece of kit, compared with the British response. 'Winnie and Poo', which I think were never much saw action. March 23rd 1942 Nine staff members of the East Kent Road Car Company were killed today when bombs fell in St James St Dover. Most of those that died were in the air raid shelter. The Carlton Club next door was also hit and among those killed were former mayor William Austen and Donald McKenzie, manager of the Co-op Bakery. Volunteers have been helping soldiers to search for survivors while ambulances ran a shuttle service to the hospital. It is believed the death toll will be about 16. Kent a chronicle of the century by Bob Ogley. It is a possibility but I think that it looks like a building of sorts. I zoomed in and there appears to another to the left and just around the corner. I just GE'd the site and think that one would be just below the craters on the top of Castle Hill or is it CaesarsCamp as I am never sure which is which. If you do look at the pic and zoom in to 200% it really looks like a building with a wall missing. In the pic of the Farmer investigating a new pond, bomb crater, there is an interesting mark on the hill behind him. I am not sure which of the hills it is but it looks like a tunnel has been bored about 40' below the summit. There are two trails coming down from this hole that look like an aerial rope way or cable worked incline (like the Lees cliff). Any one got any ideas? Sentinel S4. You're asking for ideas, Sentinel. An RAF plane, piloted by a local lad, was shot up on a mission and he tried to get back and land at Hawkinge. He failed to make it and crashed into the hillside. Could this be the spot, with the trails made by either impact or recovery of the wreckage? Any installation such as you mention would surely have been camouflaged. I know no more details of the plane but will research. The story was told to me by his widow. No's 82 & 83 Shorncliffe Crescent. The line of trees in the picture of Heritage's land will be alongside the Pent Stream, now piped under Broadmead and flowing into the pond outside the Master Brewer. All the damage seen here was caused by a single Parachute Mine dropped by a lone bomber on 12th June 1941. This resulted in 16 deaths, including six of a family of seven and caused £200,000 worth of damage. The intended target for the mine would have been the Union road (Coombe Valley) Gasworks, out of shot to the right of the photo. Note the Anderson shelter (bottem right) still standing proud a few feet from what looks like the point of detonation!!. 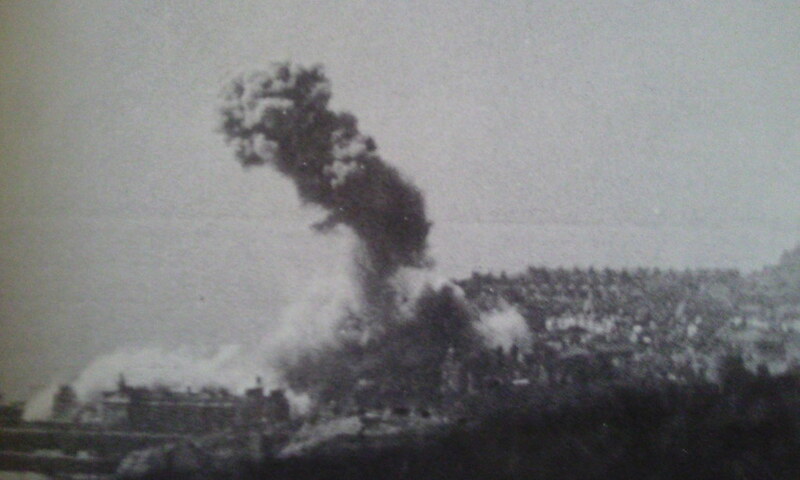 Dive bomber attack of Folkestone 26th August 1940. The Leas cliff lift can be seen in the foreground. 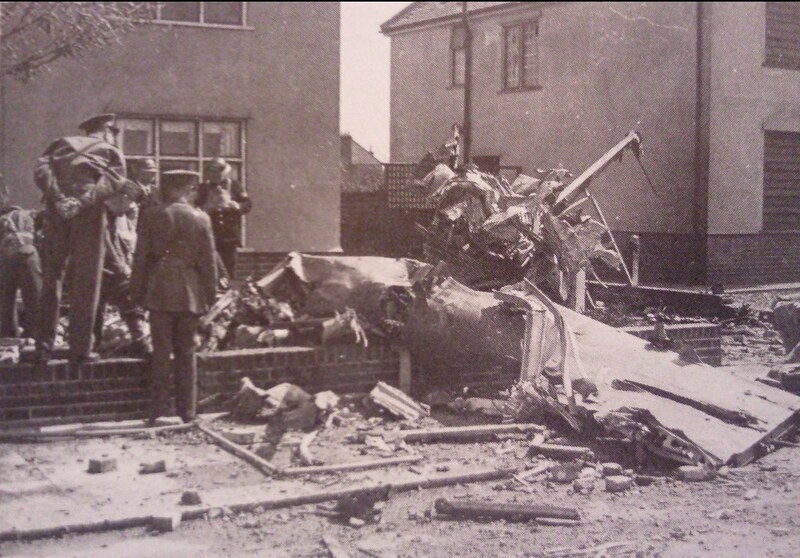 Another view of the Stuka dive bomber which crashed at Shorncliffe crescent. 10/LG1 Junkers Ju 87B. Harried by No.501 Squadron Hurricanes during dive bombing sortie over Channel. Blundered into HT cables at More Hall, Folkestone and crashed into houses in Shorncliffe Crescent 5.30pm. Uffz. H. Weber killed. Uffz. F.H. Kraus baled out severely wounded, landing outside 81 Harcourt road. Admitted to Royal Victoria hospital but died three days later. both airmen were buried in Folkestone New cemetery, Hawkinge. Dates of death given for both airmen as 15th August 1940. 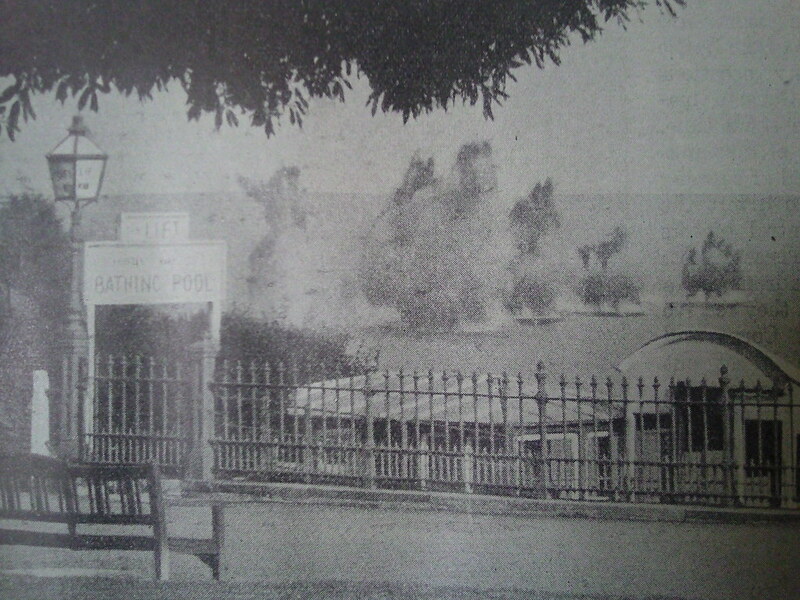 The main explosion seen is from a bomb which hit Marine terrace on 26th August. 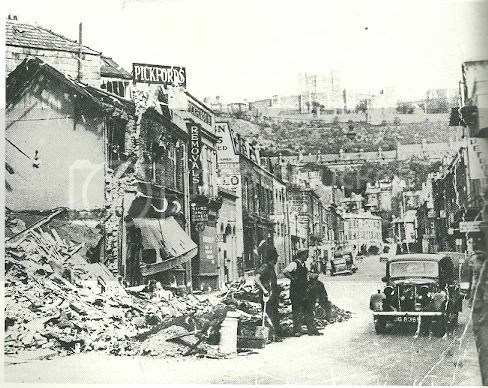 This was the worst day of bombing so far in Folkestone with 5 killed and 24 injured as well as 6 properties destroyed, 53 badly damaged and 356 slightly damaged. 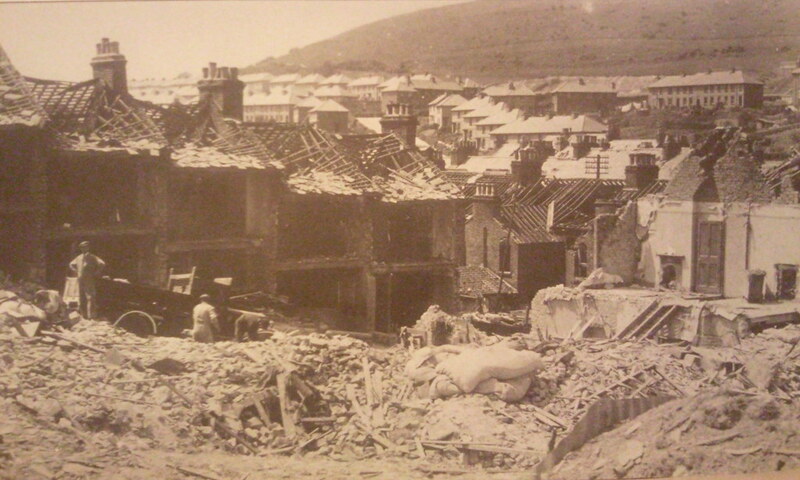 The worst hit though was Salters laundry in the Park farm area which was completly destroyed with 3 workers killed. 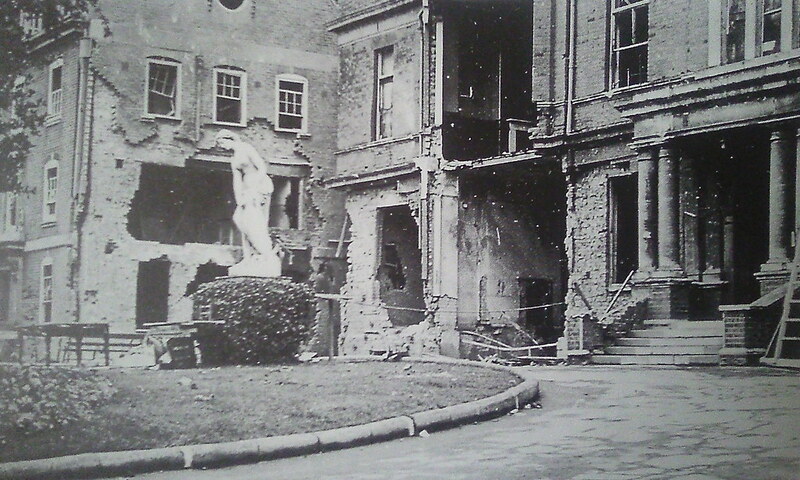 Folkestones Royal Victoria hospital after recieving a direct hit from a German shell on 14th September 1944. Two members of staff and a passing member of the home guard were killed. 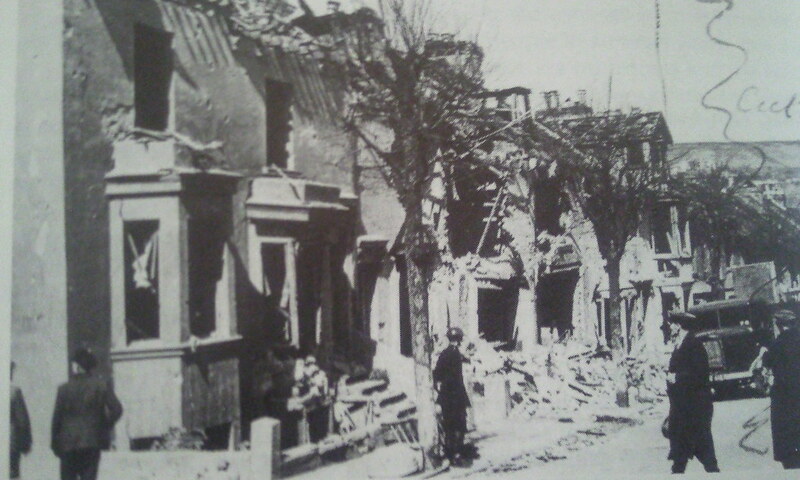 This is Ship street after an attack on the Folkestone gasworks which were on the other side of the road on 24th April 1942. After the area was cleared in 1946 99 squadron ATC (air cadets) moved here and are still there today.